This project consisted of revitalizing all facades of the 30,000-sf commercial building on two floors. 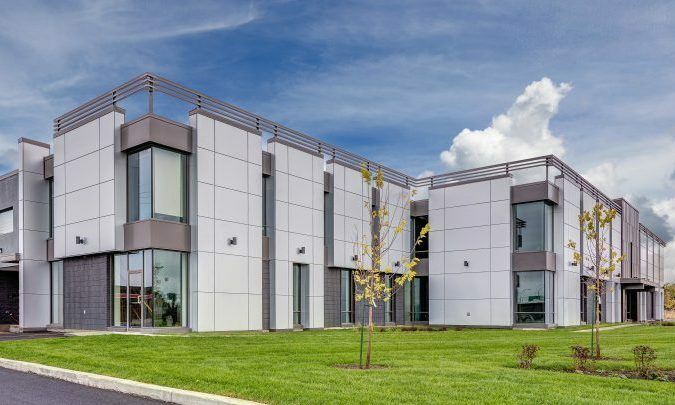 The biggest challenge of this project was to find an architectural solution to modernize the facades of the building without modifying the existing precast concrete elements that essentially serve as bracing to the structure, which would avoid putting the structure of the building in order. SODECO has worked together with the architect and other clients to achieve a solution that is both admirable and meets the client’s budget.In addition to dressing and changing the volumes of the facade, we proceeded with structural work to highlight the main entrance of the building and secondary entrances, adding awnings and architectural walls on foundations.One of the peculiarities of the project was to use exterior cladding manufactured by the company Swiss-pearl. This equipment manufactured in Switzerland had to be delivered by plane to meet the construction schedule.Finally, in order to revitalize the existing brick in a more economical way, we opted for the dyeing of the brick, which is unusual, but the result has met our expectations.